Historically, the South African energy sector had been monopolized by a single state-owned utility company (Eskom) whose generating capacity consisted of only coal-fired power stations and one nuclear power station. To help break up the monopoly and force the adoption of renewable energy, the South African Department of Energy (DOE) issued three rounds of tenders for the supply of renewable energy power plants. The opening up of this market created a flurry of activity, as investors signed land leases and installed measurement equipment in the hope of collecting site data that would prove profitable. Campbell Scientific Africa was perfectly poised for this opportunity and was ready to provide equipment, installation, maintenance, and data download services. For the first 18 months, the prospecting projects in South Africa were focused on wind energy. These assessment studies, however, did not prove promising in this geographic area. Attention then turned to solar prospecting. Over the course of a year, the consensus grew that South Africa had a better solar resource than a wind resource. Campbell Scientific Africa was able to capture a major share of the solar-prospecting projects due, in part, to its distribution agreement with Kipp & Zonen, as well as to its cooperation agreement with the University of Stellenbosch’s Centre for Renewable and Sustainable Energy Studies (CRSES). Two of Campbell Scientific Africa’s solar-prospecting projects were in Botswana and Lesotho. The Botswana project included two solar-prospecting stations for a major power utility company. The Lesotho project included three solar stations for Lesotho Meteorological Services (LMS) under a tender from the United Nations Development Programme Project Office (UNDP PO). For the two projects, the five stations used SOLYS 2 Sun Trackers with pyrheliometers, CMP11-L Pyranometers (some of which were shaded), 05103-L Wind Monitors, HMP50-L Temperature and Relative Humidity Sensors, and CR1000 Measurement and Control Dataloggers. These stations were powered by 250 W solar panels and 100 Ah deep-cycle batteries. 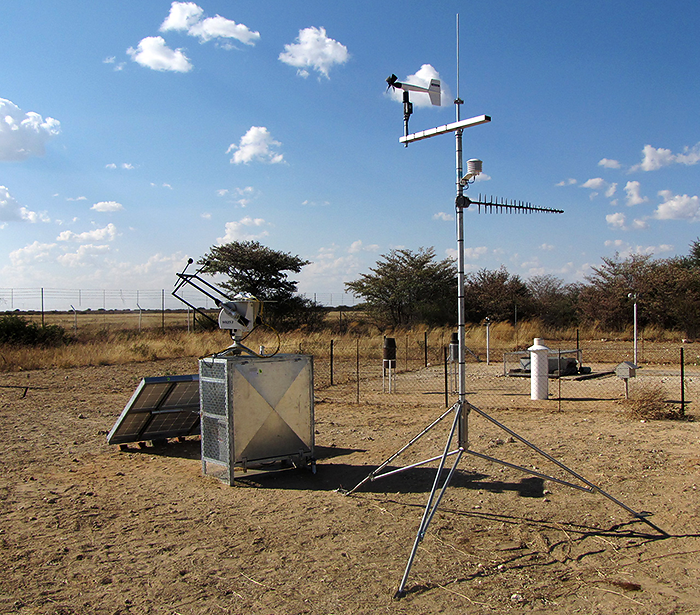 The Lesotho project used an innovative communications setup. The three Lesotho stations were equipped with Raven 3G cellular routers that were programmed to automatically open a VPN connection to a service provider. At the service provider, fixed URLs were mapped to the serial and LAN ports of the router. This enabled TCP/IP data downloads using Campbell Scientific’s LoggerNet software, as well as remote connection to the web server on the SOLYS 2 for maintenance actions. In addition, because of the fixed URLs, Campbell Scientific’s LoggerLink Mobile Apps for iOS and Android could be used to connect to the stations. Campbell Scientific Africa (Pty) Ltd.